Driving to Mars Stadium? Don’t forget to stop by the TAC Pit Stop at McDonalds Ballan on your way to the game for free coffees and Bulldogs badges. Open from 12pm. 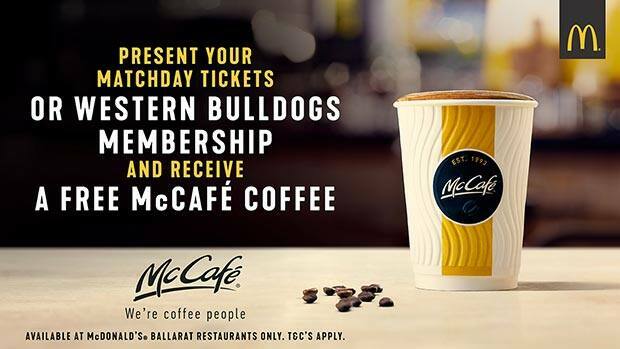 On the return trip home after the match, thanks to McDonalds, present your matchday ticket from the Round 19 clash between the Western Bulldogs and Port Adelaide, or your Western Bulldogs membership card, at any of the Ballarat McDonalds outlets and receive a FREE McCafe Coffee. Available only at the following outlets: Ballarat (Sturt Street), Ballarat (Bakery Hill), Sebastopol, Wendouree, Lucas, Ballan Westbound, Bacchus Marsh, Maryborough. Drivers are urged to utilise the hundreds of parking spaces available at C.E Brown Reserve and surrounding ovals. These parking spaces can be accessed from Dowling Street. Patrons will have access to gates 1, 2 and 3 via a short walk. Accessible parking will be available at the North Ballarat Sports Club which can be accessed via Creswick Road. Angled parking will be available in Norman Street, and limited parking will also be available at the Ballarat Showgrounds (access via Creswick Road). Footy-goers are also encouraged to take advantage of the car parks available at Midlands Golf Club in Heinz Lane and catch the free shuttle bus to Mars Stadium. No parking will be available at the current Wendouree Sports and Events Centre of Norman Street, with works currently underway on the Ballarat Sports and Events Centre redevelopment. Please note: Some parking will be subject to weather conditions. From 1.30pm, a shuttle bus will depart Midland’s Golf Club on Heinz Lane and travel to Mars Stadium - this will be continuing on a 20 minute loop until approximately 3.50pm. Shuttle bus services will depart from the Ballarat Railway Station Bus Terminal from 1.30pm on game day, running on a continuous loop to Mars Stadium. Following the final siren, return services will operate until patrons have left the stadium. These services will depart from Mars Stadium at 5.15pm and will drop off passengers in Sturt Street, opposite the Ballarat Town Hall. While Creswick Road will remain open to traffic, patrons will not have access to parking along this stretch of road between Howitt and Norman Streets on game day. This area will be set aside to accommodate buses, taxis and the patron drop-off and pick-up zones. Two drop-off and pick-up zones have been set aside on Creswick Road, available to drivers looking to drop-off/pick-up family and friends. Residents and businesses near Mars Stadium may be impacted by overflow parking. Short delays are expected, and road users are reminded to approach the area with caution. City of Ballarat local laws parking enforcement staff will be circulating the area to ensure property access is available for businesses and residences. Planning a trip to Ballarat to watch the Western Bulldogs take on Port Adelaide? Take the stress out of the drive to MARS Stadium and hop aboard the Bulldogs Bus. With buses departing both Geelong Train Station and Victoria University Whitten Oval, members and fans can secure their return transfer to the match, to and from these departure points, for just $15. The respective buses will depart both VU Whitten Oval and Geelong Train Station at 1:00pm, and will depart MARS Stadium in Ballarat after the game at 6:30pm. Tickets on the Bulldogs Bus can be purchased online via Ticketmaster via the links below. Geelong - Ballarat: Click here to book your Bulldogs Bus ticket, departing Geelong. VU Whitten Oval - Ballarat: Click here to book your Bulldogs Bus ticket, departing VU Whitten Oval. If you are traveling to and from the game along the Western Freeway, Midland Highway or Geelong-Bacchus Marsh Road, you may come across an in-progress road infrastructure improvement project. These three roads are benefitting from safety upgrades as part of the Victorian Government’s $1.1-billion Towards Zero action plan to save lives and reduce serious injuries on the state’s roads. This project covers about 100 kilometres of freeway and will largely involve the installation of flexible roadside safety barriers. About 20 kilometres of road are covered in this project, which will involve the installation of roadside and centre-line safety barriers, in addition to three new roundabouts. We want everyone driving to and from the footy in Ballarat this weekend, to get there and home safely. There are several ways to ensure you have a safe footy road trip. A safe road trip starts with a good sleep the night before. So if you are driving on Saturday, make sure you are well rested before hitting the road. If you’re feeling tired, stop for a break to stretch your legs and change drivers if possible. Eliminate distractions – stay off your phone while driving. Allow plenty of time so you aren’t rushing to get there. Drive to the conditions, because they can change quickly in the country. Take your time and stick within the speed limits. If you plan on drinking at the game, you should also have a designated driver or a plan to get home safely that doesn’t involve driving. If you plan on driving to the game, don’t drink heavily the night before. If you plan on driving home from the game, don’t plan to drink during. The evidence is clear, impairment starts at low levels and even just one drink impairs a person's ability to drive safely so the best thing people can do is to completely separate drinking from driving. Remember, if you are caught drink driving you will automatically lose your licence. Even at low levels.